The Greco-Roman portion of the 2018 Cadet World Championships begin this coming Friday in Zagreb, Croatia (viewable live in the US on Trackwrestling, subscription required). The American squad — featuring a handful of returning Fargo National champs, experienced overseas competitors, and raw-but-gifted athletes — offers as much, if not more overall ability throughout the lineup than we’ve seen in the recent past. But if there has been one slight point of consternation surrounding the prospect of a US medal in Croatia (or multiple medals, for that matter), it is the lack of prep time. Most years see the Cadets have the better part of two months to train between when the Trials wrap up in Akron and the Worlds commence. That isn’t the case in 2018. When the action kicks off on Friday and the first US Greco athlete takes the mat, a mere 35 days will have passed since the Team was originally selected. There is good reason to scoff at the compressed turnaround. As mentioned at the top, legitimate experience is available up and down the roster. And for the wrestlers who might not possess as much Greco seasoning as some others, the club coaches behind all of the Team USA representatives do. This is a well-trained, knowledgeable, and motivated group of athletes and they all understand the task at hand. Why do they understand? 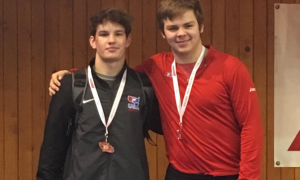 A big chunk of the credit goes to the two Cadet World Team coaches, Lucas Steldt and Mark Rial. Steldt and Rial recently presided over a training camp at the Olympic Training Center in Colorado Springs where they had the opportunity to not only put the Cadets through technical drills, but also, speak to the level of competition that will be staring everyone in the face beginning this Friday. And as you might expect, both coaches are confident in what their charges have the potential to accomplish. Rial, himself a former Cadet World Teamer (fourth in 1994), went on to graduate from the University of Northern Iowa in 2001 before embarking on an outstanding Senior Greco-Roman career that included a National title in 2008. After his competitive days were through, Rial became an assistant at Iowa Central Community College while also staying involved with age-group athletes during the summer. In addition to recently being named the head coach at Buena Vista University, Rial was also recognized as Iowa USA Wrestling’s 2017 Person of the Year. Most inside of the United States Greco-Roman community are aware of Steldt, whose Combat Wrestling Club in Wisconsin is one of only very few which offer training in the style year-round. One of the most active age group coaches in the country, he has also gained an enormous amount of experience leading athletes overseas, as evidenced by his Go Greco USA Developmental Program and his numerous trips to Sweden and Austria with Northern Michigan. 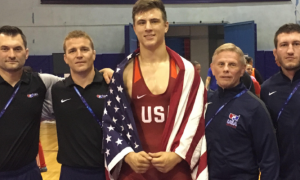 2018 represents Steldt’s second-straight year as a Cadet World Team coach. “I am excited! As much as our athletes need overseas experience we as coaches do, as well. I travel overseas traditionally three-four times a year. I see and interact with competitors and their coaches at camps and competitions. The athletes we take overseas do the same. As we have witnessed recently the past few years, our American athletes have been acclimating to the foreign experience. The Go Greco movement has been in full effect. While we still need more growth and education in our country regarding Greco Roman wrestling, I like what has happened so far. “This year’s Team finally has some athletes with international Greco-Roman experience and results behind that. 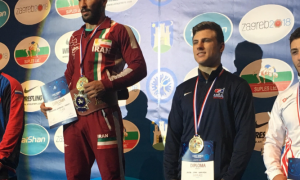 It has been proof positive that the athletes in the past with previous overseas experience and consistent Greco-Roman training have faired well at Worlds. Does this guarantee Team USA medals? Hell no. But it gives us a solid baseline to train and develop our athletes into becoming World-level Greco-Roman athletes.